Hello friends, sorry for the lapse in reports over the past week, I've been out playing too much and have not spent much time on the web. Things are looking pretty dang good here in the Kittitas Valley, with the snowpack continuing to pile up in the mountains, and little to no lowland snow in the valley. That translates to good water levels this summer, but plenty of access to boat ramps in the early season (rarely does it work out that we have BOTH in the same year). 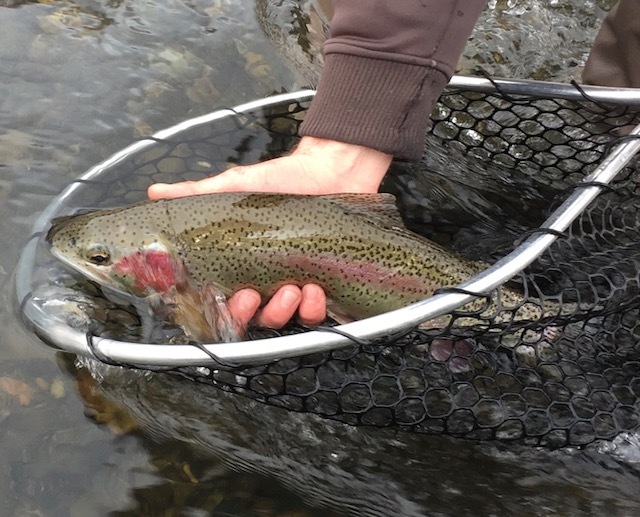 Fishing has been good on the Yakima over the past week, although there has been a definite improvement over the last few days as the weather has warmed up. A recent development is that nymphing the Pat's/San Juan combo has stopped working entirely.....just kidding. The ol' turd and worm is still producing, and that should continue through the beginning of March. Streamer fishing has been a bit more of a mixed proposition. Some days have been better than others, but we are still waiting for it to go off like it did earlier in the winter. For those that are looking to fish the streamer, Sparkle Minnows, Sculpzillas and Dolly Llamas have all been picking up a few. Olive is a pretty safe bet for this time of year color-wise (or gold/olive in the case of the Sparkle Minnow), but don't be afraid to throw black, white or tan if things are slow. We are just about to roll into the month of March, so keep checking in, hopefully we'll start seeing some Skwala adults kicking around in the next couple of weeks, and if you haven't already, check out our Skwala Guide Trip Special. $300 gets you and a buddy 5 hours of fishing from a drift boat with some of the best guides in the valley, and we'll even throw in a BBQ lunch halfway through the day, pretty hard to beat! Call the shop at (509) 607-1804 for more info.